Very easy install when you follow the video along with Bart. Extremely easy programming button to get the combo that I like the most. If you're looking for a clean backend, with plug and play components, look no further! Incredible craftsmanship on this product, I actually had a different tail today solution tht I took off once I found this product. The fit and finish is of the highest quality, and I am extremely picky about how all of my stuff looks, especially my bike. - left and right aren't labeled, and Bart says so in the video and to test which one is which. It is minor, but shouldn't have to be "figured out." - if you don't use the license plate light, it would be nice to have a cap/plug so that is protected from water/dust in this kit. - again, these are minor, this thing really is awesome! Ordered Friday. Received Monday. Once I opened the custom hand drawn dank meme box. I was blown away by how dark the smoked lense really was. Once I Installed it along with the relay and turned the ignition on I was even further impressed buy how bright it was given how dark the lens is. Modes functioned great. Install was very easy and took about 40 minutes total including pulling the fairing for the relay. Advantages: Truly cleans up the rear end of the ugly stock turn signals. Extremely bright, I’d wager a bit brighter than stock. Worth every penny. I got the smoked lens and its still much brighter than OEM. Really cleans up the rear of the bike and flows nicely with the body lines. I also really like the different setting. Im currently using the one that flashes when you hit the brake. It really grabs your attention when you're behind the bike, which i want when I'm riding in the city. This taillight absolutely completes the rear-end of my FZ07. 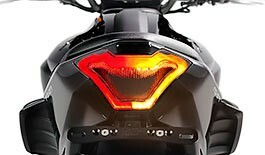 The back end of the bike is already black due to the black plastic and this light blends in perfectly when the bike is turned off (the light is practically black, I wouldn't really call it smoked). However, when the bike is at idle, the perimeter is lit up with your typical red brake-light color. When the brakes are actually engaged, it's plenty bright! I really love not having ugly turn signals, too. With the turns signals being integrated into the light, the back end of my bike is super clean looking. TST, thank you!!! This was one of my first purchases on my new bike and I am insanely pleased by the aesthetic. I also had some issues with install and had an insanely fast response time that helped me iron out my issues. Advantages: Amazing look that defines the back of the bike. First off they look great. Compared to the factory ones they are very nice. Advantages: Easy to install, they look great. Disadvantages: There is no videos or anything on how to program these. Note to tst, put a how to video on the tail light page showing how to program. Install was super easy. Nice to trim some fat on the FZ. Also installed flush mount fronts, flash relay, womet levers and fender eliminator. Advantages: While I had the seat and side panels off I reached in and yanked the snorkel out of the air box! Bonus!